Turkey's "Election 2015" overcame justified fears of major ballot-box fraud, which many thought would reinforce the ruling Islamists and pave the way for worse-than-Putinesque totalitarian rule for President Recep Tayyip Erdogan. The election results themselves are proof that any potential vote-rigging in favor of Erdogan was too little or too unsuccessful to become a game-changer: The ruling Justice and Development Party (AKP) needed at least 330 seats in parliament in order to rewrite the constitution in the way Erdogan wants; it got merely 258, not enough even to form a single-party government -- leaving them in the minority in parliament for the first time since the AKP came to power in 2002. Ironically, the AKP objected to the Supreme Election Board's vote recounts in two provinces and three towns -- all too small to change the fact that Erdogan is the lonely sultan in his spacious, $615 million presidential palace. The 7 June parliamentary elections were characterized by active and high citizen participation, during the campaign and on election day, which demonstrated a broad commitment to holding democratic elections... The elections were organized professionally in general ... Overall, the voter registration system is well developed ... The counting and tabulation processes were noted as generally transparent, although some important procedural errors were observed. 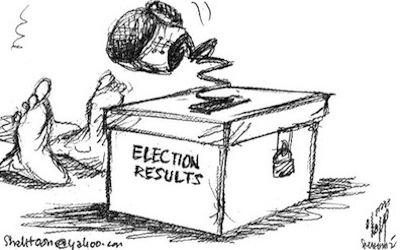 The preliminary report did not mention any ballot-box rigging. Turkey's Western friends were happy, too. In a joint statement, the European Union's High Representative for Foreign Affairs, Federica Mogherini, and European Enlargement Commissioner Johannes Hahn, said: "Turkey's general election on June 7 took place with a record 86% turnout, a clear sign of [the] strength of the Turkish democracy." Turkish voters have left a difficult enigma for their politicians to resolve. Across the ocean, U.S. State Department spokesperson Jeff Rathke said, "We congratulate the Turkish people for their participation in yesterday's parliamentary election," adding that Washington was looking forward to working with the new Turkish government and parliament. All looks peaceful, except that Erdogan, the only undisputed loser of the election, must be the unhappiest man in Ankara. But the Turkish voters have left a difficult enigma for their politicians to resolve. For the first time since 2002, the Turks do not know who will govern their country, several days after they voted for their choice of parties. What are the options? Can you spot the two nationalist parties? The Justice and Development Party (AKP): Erdogan's own creation and foray into Islamist politics, established in 2001. Since then, it has won all elections, parliamentary and local, and has run single-party governments. In August 2014, Erdogan, after serving as prime minister since 2003, was elected president and got his foreign minister, Ahmet Davutoglu, elected as prime minister. According to the Turkish constitution, the president should be non-partisan -- a principle which Erdogan has too happily violated. He campaigned for constitutional amendments to introduce an executive presidential system. Any constitutional change requires 367 seats in parliament, or 330 if it would be approved by referendum. In other words, Erdogan needed at least 330 AKP members in parliament to seal his one-man show in the shape of an all-too-strong president. 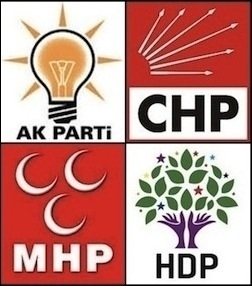 The main opposition Republican People's Party (CHP): The AKP's main political rival. It advocates a secular state, and opposes the AKP's Islamist polity, in Turkey and abroad. It also opposes the AKP's support for jihadists in Syria and Iraq, as well as for Hamas. 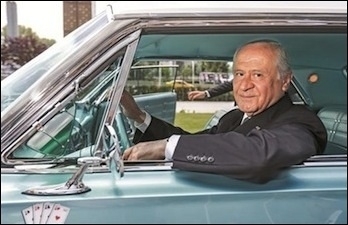 The right-wing Nationalist Movement Party (MHP): It ran a fiercely anti-Erdogan, anti-corruption election campaign. MHP cadres are post-modern nationalists. Being right-wing, they are the first non-AKP address for disenchanted Erdogan supporters. In the past, the MHP supported the AKP's moves to Islamize Turkey, including removing the campus ban on the headscarf. They are not Islamists but, being nationalist-conservatives, cannot do without championing Islamic values. One of the MHP's election campaign pillars was the party's objection to the AKP's peace negotiations with Kurdish rebels. The pro-Kurdish Peoples' Democratic Party (HDP): This party was the indisputable winner of the election. It managed to pass the national threshold of 10% needed for parliamentary representation by surprisingly winning 13% of the national vote. The Kurds, under one roof of a political party, are in the Turkish parliament for the first time in the country's history. The HDP campaigned against the AKP and Erdogan, but in favor of the continuation of peace talks with Kurdish rebels. It advocates autonomy for Turkey's overwhelmingly Kurdish southeast. Its charismatic leader has ruled out any constitutional change that would make Erdogan an executive president, or that would form a coalition government with the AKP. 1. AKP+CHP (389 seats): This is a German-style "grand coalition." Although the worst of political enemies since 2002, neither party has ruled out this option. These days they look like unlikely "strange bed-fellows." The odds are against this option, but a Turkish grand coalition is not altogether impossible. In this scenario, Erdogan remains president but with symbolic, not executive, powers. 2. AKP+HDP (339 seats): The HDP will likely honor its pledge and refrain from forming a coalition government with the AKP. But it may agree to support an AKP minority government without directly taking part in it. What will it gain in return? Resumption of peace talks with the Kurdish rebels, constitutional recognition for Turkey's Kurds and some degree of autonomy for the Kurdish southeast, all of which are the party's raison d'être. In this scenario, Erdogan remains president but with symbolic, not executive, powers. MHP head Devlet Bahceli called Erdogan "the loser" of the election who should resign, but is willing to form a coalition with the AKP under certain conditions. 3. AKP+MHP (338 seats): This is a relatively strong option compared to the others. If it is to materialize, the MHP will insist on sending to court former AKP ministers charged with corruption in a December 2013 scandal; limiting Erdogan's constitutionally-defined powers even more than they are today, and scrapping peace talks with the Kurds. This option is unlikely to materialize unless the two parties were to agree on a compromise in all three contested areas. In this scenario, Erdogan remains president but with symbolic, not executive, powers. 4. CHP+MHP+HDP (292 seats): MHP rules out any coalition including the pro-Kurdish party its own raison d'être obliges it to oppose. But a CHP+MHP minority government can have HDP's support outside the coalition, if the nationalists can digest this "embarrassing" situation and agree to deliver to the Kurds "some kind of autonomy." A highly unlikely scenario. But in the unlikely event that it miraculously happens, Erdogan remains president with symbolic, not executive, powers. 5. Early elections: According to the constitution, President Erdogan may dissolve parliament and call for early elections if no party can form a government and win a vote of confidence in parliament within 45 days after the elections. No one among Turkey's exhausted politicians wants early polls. They have no energy for another indecisive election or for spending another fortune on one. Parties know that an early election any time soon will produce more or less the same indecisive results. Moreover, the AKP fears that a lack of prudent economic management and a potential financial crisis during the political crisis could cost the party even more votes than on June 7. Like others, in this scenario, too, there seems to be no room for a worse-than-Putinesque rule by Erdogan.